Astronomers waiting for their first chance to watch a supermassive black hole (SMBH) consume a vast cloud of in-falling gas have discovered a magnetar near the core of the Milky Way galaxy. By observing the magnetar’s behaviour as it orbits the SMBH, they will be able to test some of the more interesting consequences of Einstein’s General Theory of Relativity under more exotic conditions than ever before. Several years ago, astronomers discovered a vast cloud of gas and dust, containing several times as much mass as the Earth, drifting through space on a collision course with the SMBH at the centre of our own galaxy. They have been keeping an eye on this cloud (known as G2) because it will be the first time we’ve been able to directly observe something falling into a black hole. Well-established theory predicts that, as the gas cloud begins spiralling down into the black hole, tidal forces will cause parts of it to move much more rapidly than others. The resulting friction and compression will heat it to extremely high temperatures, making it glow brightly across the electromagnetic spectrum. By comparing what we actually observe to computer models already generated, astronomers will be able to see how close their theories are to reality, and improve them. The show isn’t expected to begin until at least September this year, so Astronomers were surprised to detect a long-lived X-ray flare coming from the direction of the SMBH two months ago in April. Some speculated that perhaps G2 was already beginning to heat up and emit radiation, while others remained skeptical. The science teams behind NASA’s Nuclear Spectroscopic Telescope Array (NuSTAR) and Chandra X-ray orbital telescopes, decided to take a look. Chandra is a high-resolution telescope, able to detect very fine details, while NuSTAR can detect very rapid changes. Between them, they found a strong X-ray signal pulsing every 3.76 seconds, coming from a point just over a third of a light year away from the black hole. When a very massive star dies in a supernova explosion, its core is compressed down into a neutron star. Often, thanks to the conservation of angular momentum, these neutron stars end up spinning extremely rapidly, and emitting strong beams of radiation from their poles. These beams are slightly offset from the star’s axis of rotation, so they sweep across the universe like the lamp in a light-house. If Earth is in the right place then we can detect these beams as a rapidly flashing pulses of electromagnetic radiation, which is why we call this type of neutron star a pulsar. In other words, the flare that was detected was not from G2, but from a pulsar closely orbiting our galaxy’s central SMBH. Pulsars usually keep an extremely accurate rhythm, almost as reliable as our best atomic clocks, but this new pulsar is slowly losing time. Part of the reason they’re normally so accurate is their immense mass. It takes a tremendous force to change the speed at which something that massive spins, and we only know of one way that such a force can be sustained to cause the constant gradual slowing that astronomers are seeing here: this pulsar has a very powerful magnetic field, which applies a steady drag on its rotation. Technically, neutron stars with such powerful magnetism are known as magnetars, and their spin-rate is slow because of the braking effect of their magnetic field. 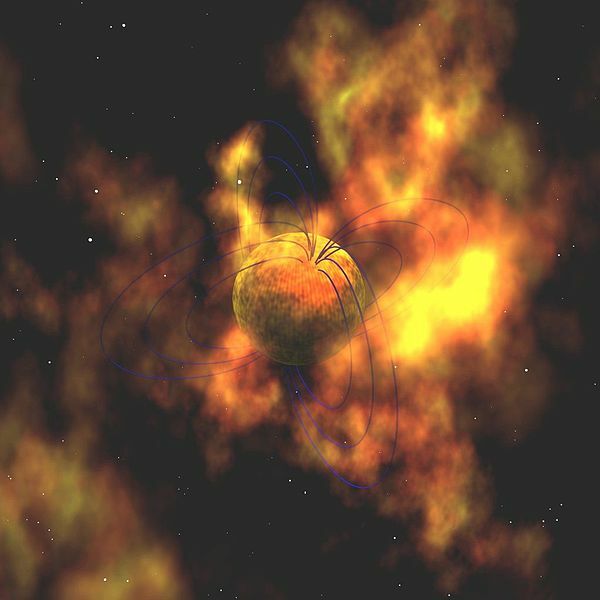 Magnetars are both extremely rare, and some of the strangest places in the universe, so are studied keenly by astrophysicists. However, this magnetar’s proximity to our SMBH makes it even more interesting: One of the predictions of General Relativity is that gravity distorts time, so that a clock placed in a strong enough gravitational field will tick visibly slower than a similar clock far away. Putting a clock as accurate and predictable as a pulsar in an elliptical orbit through a gravitational field as powerful as that created by a SMBH creates an ideal laboratory for testing this prediction under extreme circumstances. This is an opportunity that will not go to waste!